Whether new to the industry or building on years of experience, it’s easy for businesses to fall into the trap of employing ineffective social media advertising practices. People come to social platforms to keep up with friends, learn something new and experience a range of emotions. Given the sheer volume of content in this space, brands will miss their opportunity to reach new audiences if their ads can’t cut through the clutter. It takes a combination of arresting creative and relevant targeting to break through in the feed—especially since consumers are often biased against ads. It’s true, people don’t welcome ads with open arms. 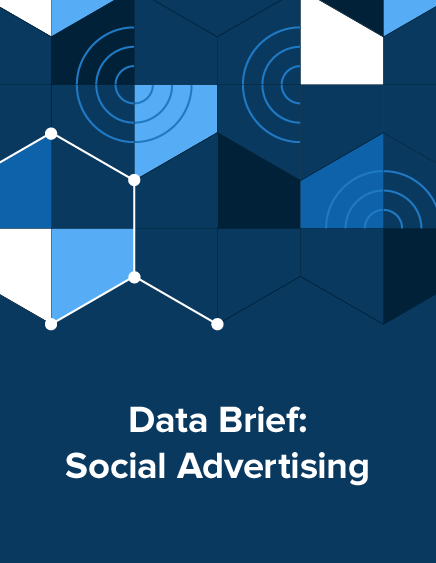 In fact, our survey of more than 1,000 Americans found that their collective perception of social advertising has mostly stagnated or declined in the past year. 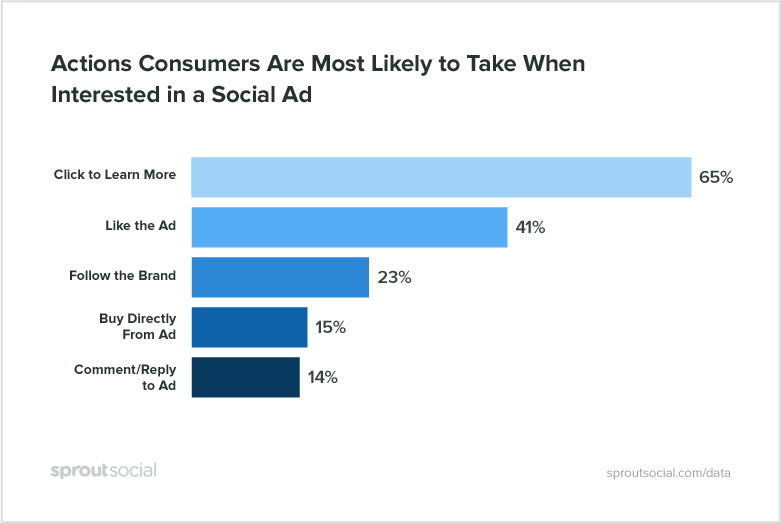 This indicates that when on platforms like Facebook, Instagram and Twitter, a majority of consumers aren’t finding much that stops them from scrolling right past brands’ ads. And while 39% of consumers attributed their declined perception of social ads to recent political events, the top reason for the drop cited by 58% of respondents was simply seeing too many social ads overall. 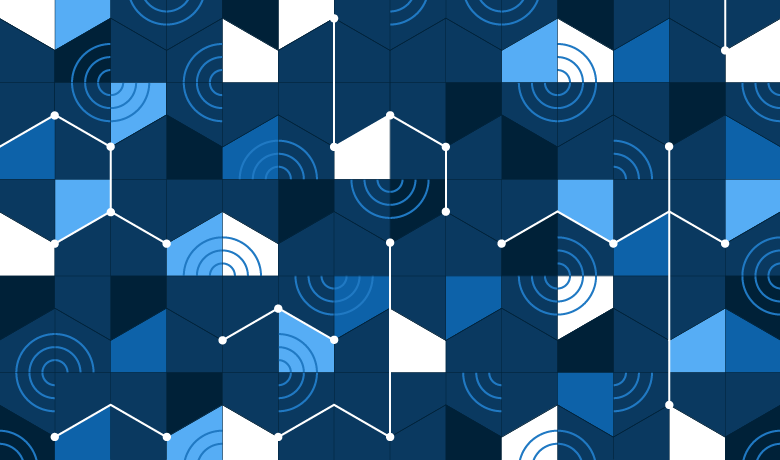 With the wealth of data and targeting options out there, social should open doors to hyper-relevant advertising. But this paradox of choices has overwhelmed, rather than empowered, many marketers on the path to producing better ads. How can marketers break the mold on social and create ads that drive conversions, conversations and maybe even a viral hit? The coveted scroll-stopper ad doesn’t necessarily include the flashiest celebrity or the most provocative tagline. What does it involve? 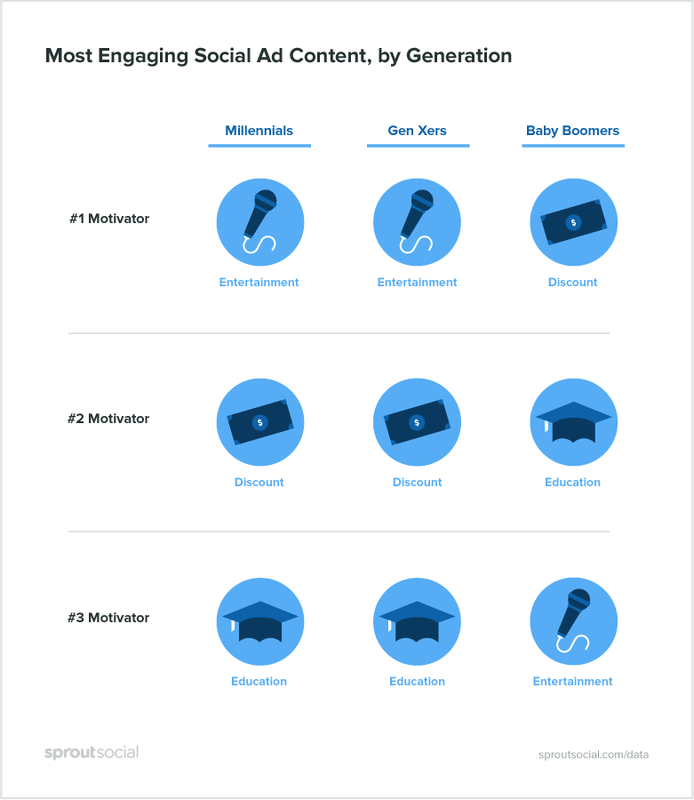 Read on for new data that breaks down what makes people take action on social ads. While this philosophy seems obvious, most social ads fail to put it into practice. It’s clear that to succeed on social, marketers must go back to basics when developing their ads. By and large, entertainment is still the single best way to stop the scroll, with 41% of people reporting that entertaining content makes them more likely to engage with a social ad. But what does “entertainment” mean in practice? Good news: It doesn’t necessarily require the creative resources of a global conglomerate, but it does call for an investment in visually driven content. On social in general, Sprout research shows that video is one of the main formats people want to see from brands (83%). GIFs also perform well with 58% of people enjoying them—among Millennials, this rises to 70%. Brands that go beyond stylized product shots and into content that inspires emotion in prospective customers will have more success being noticed and remembered. These messages also don’t have to be delivered by a paid third party, whether a celebrity or a niche influencer. This might surprise many marketers. After all, isn’t partnering up with influencers a great way to introduce your brand to potential customers and deliver unique content? Sort of. Though the popularity of influencer marketing has created thousands of professional entertainers working in social, an influencer partnership isn’t the only route to engagement. People are more interested in seeing ads from brands than from influencers—57% to 43%, respectively. Our findings underscore a preference for transparency, with advertising coming straight from the brand itself. When brands turn to social to build top-of-funnel awareness—in the paid or organic realms—entertainment can open the door. Invest in a social team or resources that support creative multimedia content development, driving an introduction to your brand that intrigues and attracts customers. Whether it’s branding a character like The Most Interesting Man or crafting a short video with an inspiring message, your team must have the internal buy-in to develop and iterate on concepts that will drive greater results than your average product shot. While building awareness is important, ensuring potential customers understand what your brand offers is just as crucial. The latter requires that consumers make personal connections with your brand—they might appreciate your differentiators, share the values you’re communicating or learn a new skill that your offering enables. This type of advertising makes people feel good about your products and confident in choosing your brand over others. So what kind of content can help? Education. Our survey found that a third of people are more likely to engage with social ads that teach them something. No wonder Tasty’s rapid-fire recipe videos had such a meteoric rise. Whether it’s a recipe video, a style tutorial or a behind-the-scenes look at how products are crafted, educational content positions your brand as a resource and leaves consumers wanting more. 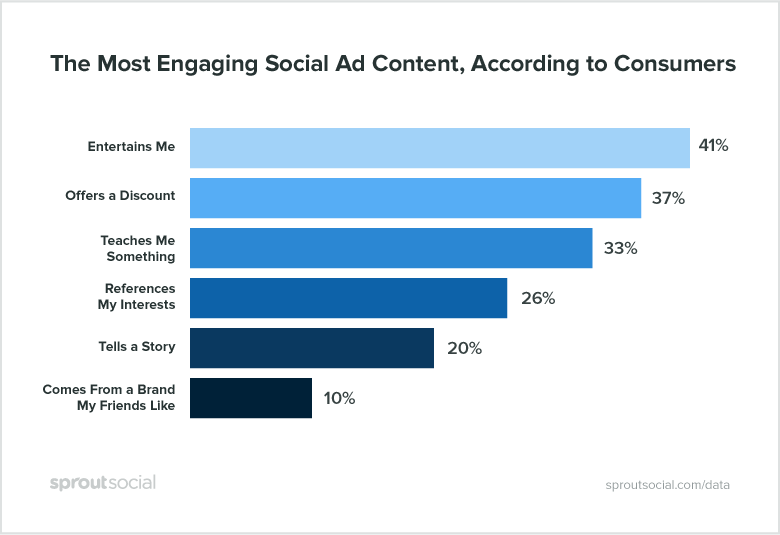 Furthermore, people who would engage with a social ad that interested them aren’t looking to buy directly—instead, 65% of consumers will click through to learn more. People want ads that promise further education, whether it’s about the product, subject matter or an adjacent topic. 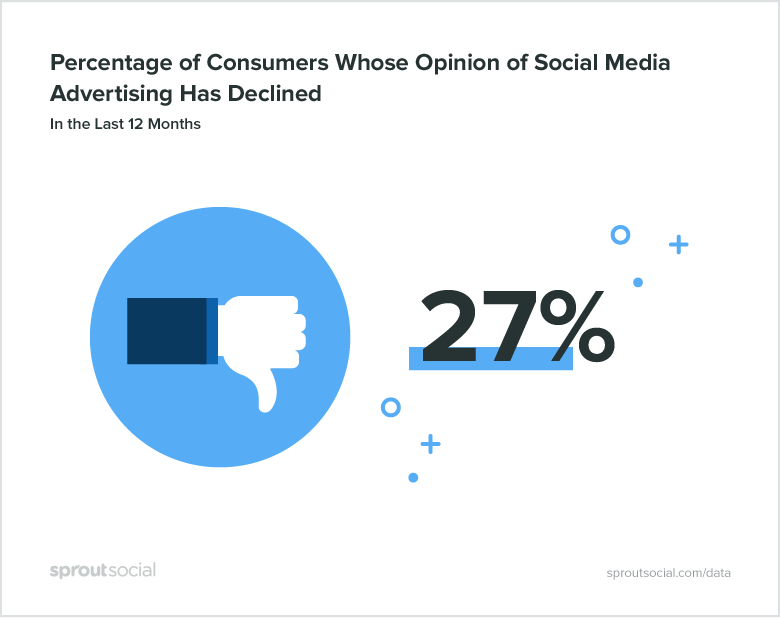 There’s even more good news: where opinion of social ads is declining, it’s often because the content is uninteresting (31%) and irrelevant (26%). Creating educational content that adds value to consumers’ social experiences naturally addresses these two areas of dissatisfaction. That’s call to education. Remember, most people aren’t logging onto popular social channels to shop. Rather, they seek a social experience. That’s why CTAs centered around education and learning are a solid bet: read more, watch more, learn more. This is great for brands, as it’s another opportunity to add value into routine interactions and remain top of mind until people are ready to convert. Educational ads hold value after consumers have made a purchase as well—in particular for big-ticket items, such as a car, that only come around every few years or decade. In the interim period, fresh content reinforces the positive emotions a consumer felt when he or she made the original purchase. Content that showcases new or unexpected uses also helps the item continue to add value in consumers’ eyes. Cultivating brand loyalty and advocacy over time requires educating your existing audience about what differentiates your brand—something your paid and organic social programs can tackle in tandem. Social has opened the floodgates to new types of creative ad experiences, but there’s one advertising classic that never gets old: discounts. While entertainment may be king, it should come as no surprise that across generations, 37% of people are more likely to engage with social ads that save them money. While the decision to offer a discount may require buy-in from others in your organization, the ability to communicate value is always on the table. Given Baby Boomers’ preference for discounts and educational content, there’s an opportunity to combine the two into stories and messaging that highlights your value proposition and connects with this generation, even if there’s no immediate sale. Every campaign should open with one question: Who are you trying to reach? If this isn’t something you can easily and confidently answer, go back to the basics. Knowing that Millennials care less about saving money than they do about being entertained and making an emotional connection to brands—and that Boomers are looking to save cold hard cash—there’s no reason to blanket a diverse range of audiences with a single message. As the adage goes, price communicates value. If you know which audiences truly desire discounts, you can be judicious with your financial incentives—and offer them to the right groups. The golden rule is this: Know your audience and use the tools at your disposal to speak directly to them. Otherwise, you’re practically inviting people to scroll right past your ads on social. But knowing what types of ads motivate your audience to action is just one piece of the puzzle. The other is delivering those ads to the right people at the right time. No matter what creative you use—and whether you’re offering discounts, entertainment or education—the most effective ad is always a relevant one. The best way to ensure your ads make a personalized impact is to understand the specific audience you’re trying to reach. Then you can tailor your message and target accordingly. Test your messaging across different paid audiences to understand what resonates, then iterate based on those results to ensure budget, strategy and consumer expectations are in alignment. The common denominator across all our findings is “me, me, me.” That shouldn’t be surprising. Getting to know your audience in depth and breadth demonstrates a commitment to seeing them as real people instead of sales targets. The consumer research process also ensures a more strategic use of your marketing budget to gain a competitive edge. The stakes have never been higher: 93% of firms are investing marketing budget in Facebook, 67% in Instagram and 51% in Twitter, according to Hanapin Marketing. Bottom line: If you’re going to spend, be diligent and be social. Get inside your consumers’ heads — and know exactly what inspires them to take action. This survey was conducted by Survata, an independent research firm in San Francisco. Survata interviewed 1,004 online respondents between March 5, 2018, and March 6, 2018. Respondents were reached across the Survata publisher network, where they take a survey to unlock premium content, like articles and ebooks. Respondents received no cash compensation for their participation. More information on Survata’s methodology can be found at http://survata.com/methodology.